Following on from my Ships Crew article not so long ago, I managed to dig out a box containing a number of Traveller miniatures from the various boxed sets that were available. In addition, there are a few that were added on to the Traveller line after the boxed sets were pulled from Games Workshop’s range in late 1983. 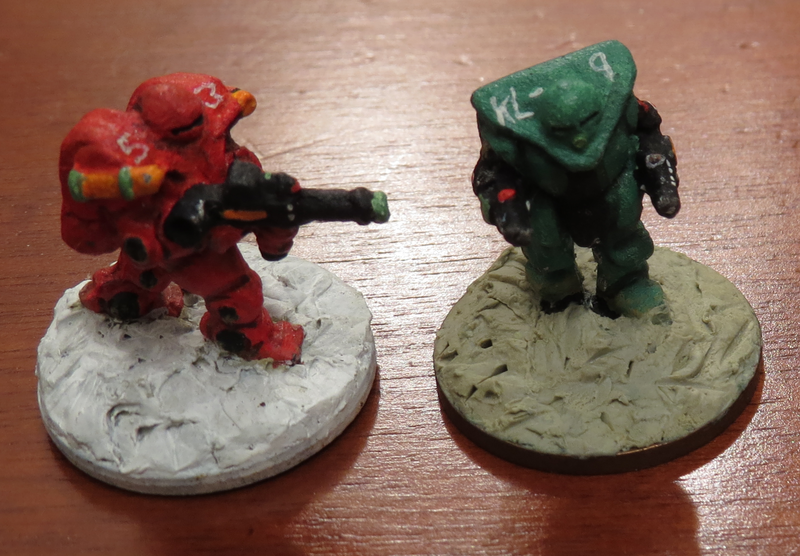 I’d like to present these paint jobs after they last saw light around thirty years ago; thankfully they’ve managed to survive until today and I’m fairly sure I have got some more lurking in my garage somewhere. 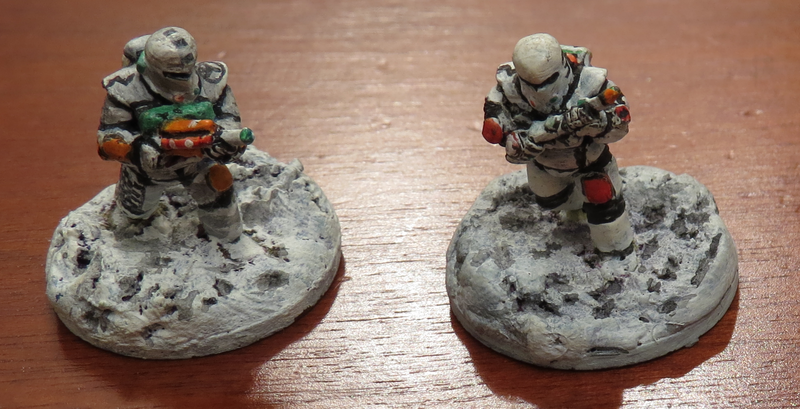 Featuring Star Wars-style Imperial Stormtrooper white paint job and flourescent detailing, these marines will have absolutely no chance in being able to hide aboard a starship. The chap on the right is probably my favourite. I think the red markings on the marine on the right have stood up well after thirty years, a good action pose featuring a rifle of some sort. 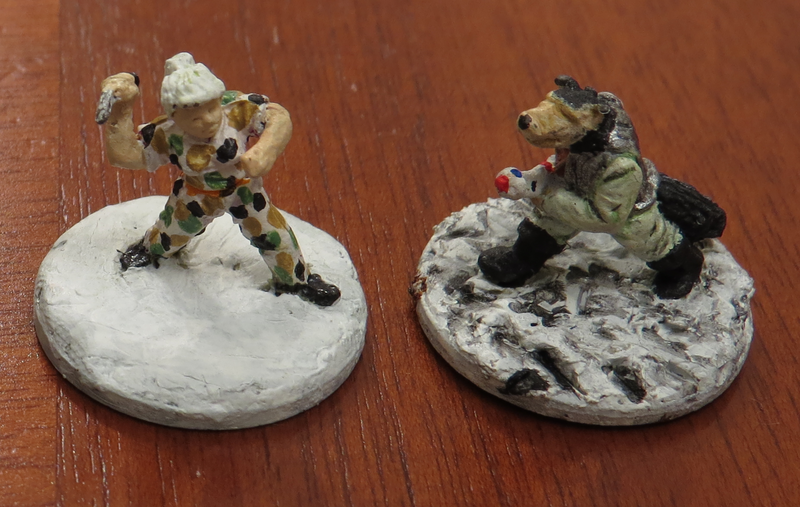 The bases are one pence pieces with milliput modelling putty to fix the figure to the base. 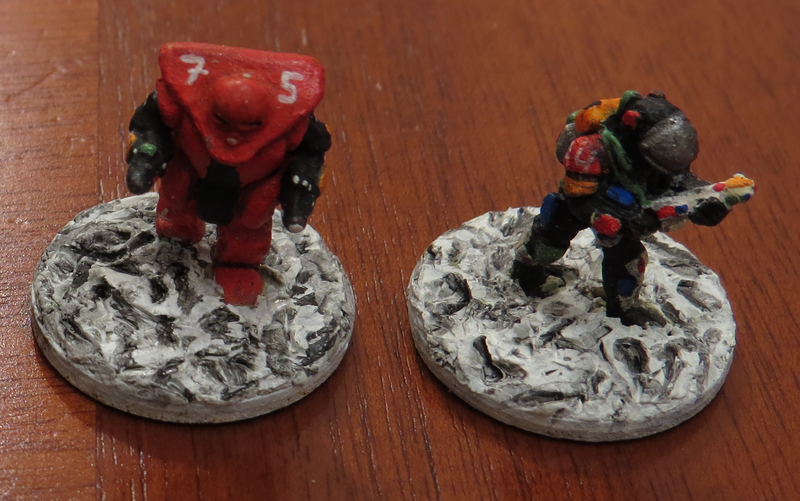 A deviation from my usual paint jobs that ended up on these particular figures, having a mainly white main colour with some red and black detailling. I decided to go for something more colourful, here orange forms the main base colour but with black under the markings, which I think enhances the stripes. Nice bright colours which I think would lend themselves to a real zero-g environment, easily spotted when working outside a starship. 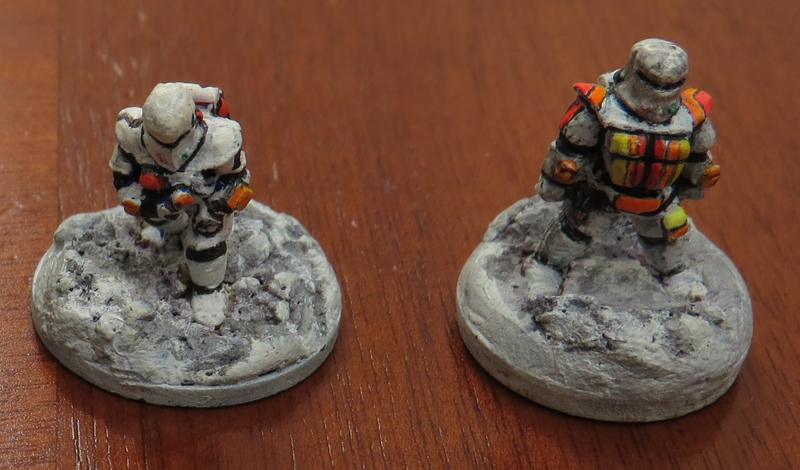 Unfortunately the chap on the right never got his base painted properly. A tribute to the comic character ‘Mad Gav’ from the White Dwarf series ‘The Travellers‘ which was one of my favourite sections of the magazine. 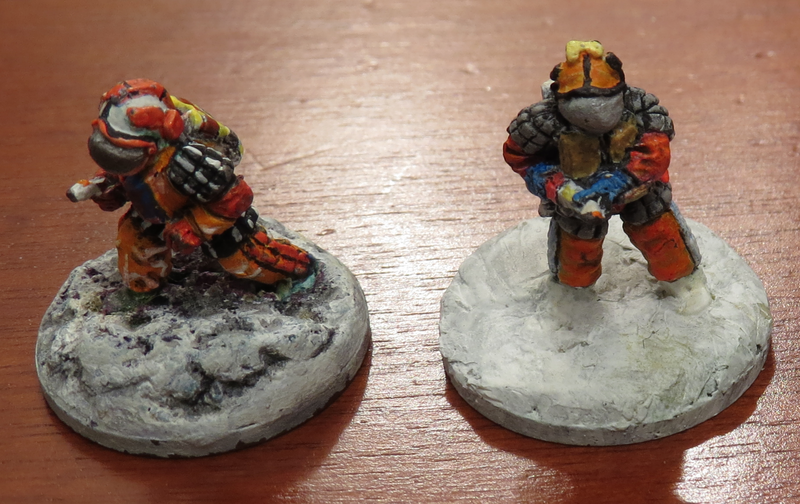 One of the miniatures from the ‘Military’ boxed set I think, repurposed. The chap on the right is another tribute to another eighties phenomenon ‘breakdancing’, hence the word ‘break’ painted onto his cap. Not something I ever tried I must say. 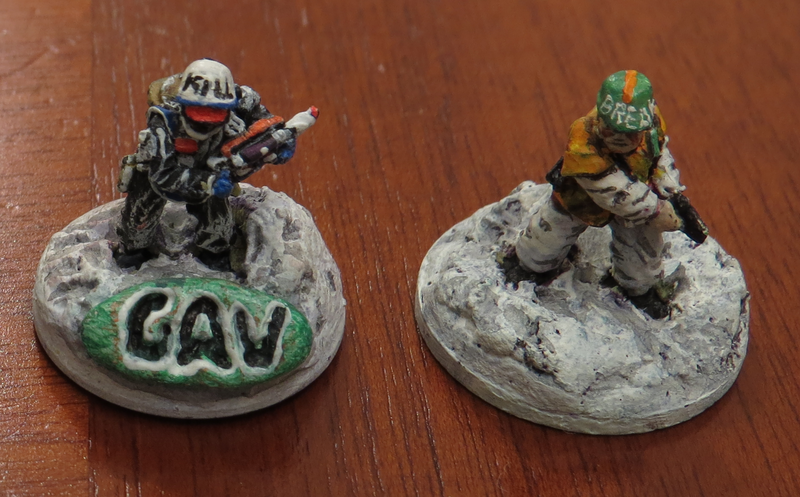 Ok, I know that isn’t the proper title for the figure on the right, but I always envisioned him to be some sort of scruffy adventurer that whips out his rifle from under his grey mac. The pilot on the left obviously taking inspiration from Star Wars rebel pilots garb again. The female adventurer is another figure of mine that never got finished, evidenced by the lack of colour for her hair and the plain white base. If I remember, I don’t think I was completely happy with the camouflage colour scheme and I halted finishing the paint job. The Vargr was a favourite from the ‘Aliens’ boxed set I bought. 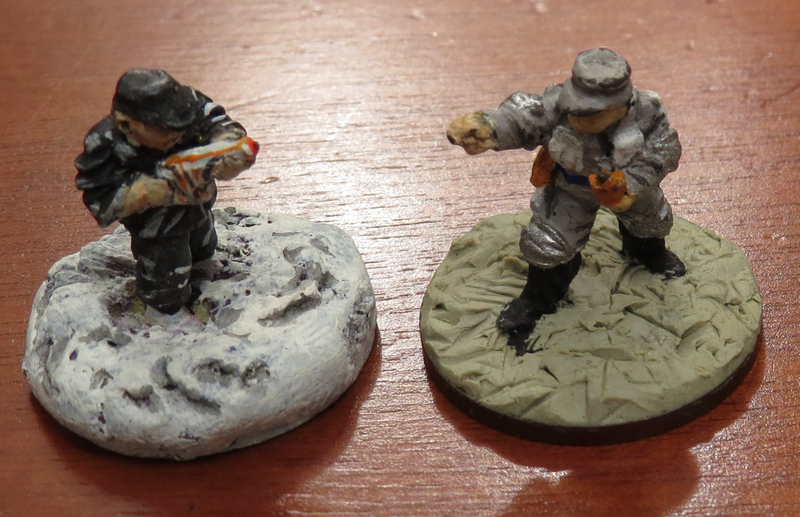 Two differing colour schemes here; the officer on the left is one of the later schemes I’d tried out whereas the figure on the right dates from 1983 and must be one of my original paint jobs. Unfortunately he has an unpainted milliput base. These two have always been a bit of an ‘oddity’ for me, in that they were never part of the original boxed sets. I remember first seeing them in the ‘Citadel Compendium’ as hand-drawn figures (rather than bare metal photographs) and I think I picked these up in some multi-pack blister packs. The final image, this one having another Dreadnought-armoured character and the figure on the right being a member of the boxed set ‘The Military’. 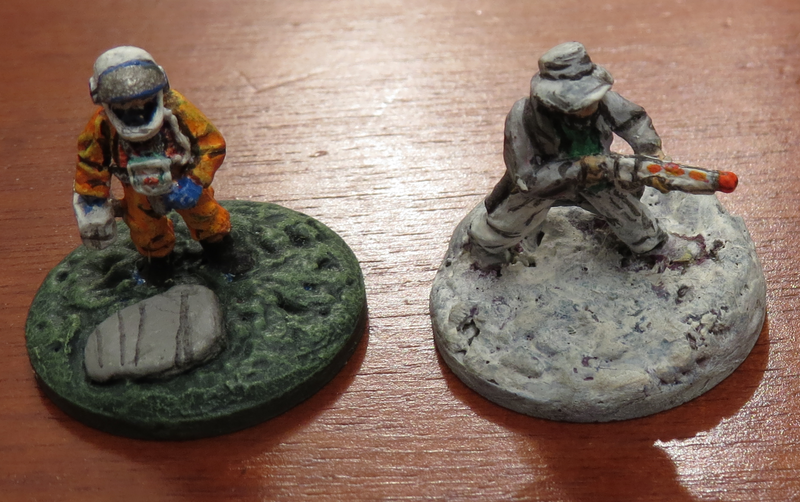 This particular figure (on the right) I know I have several of as they were sold off in blister packs when GW decided they wanted rid of their remaining Traveller miniatures stock. So there we go! I’m pleased the figures have stood the test of time and the paint jobs have remained, if I find any more whilst digging in the nether recesses of my home I’ll get some more images posted on here. 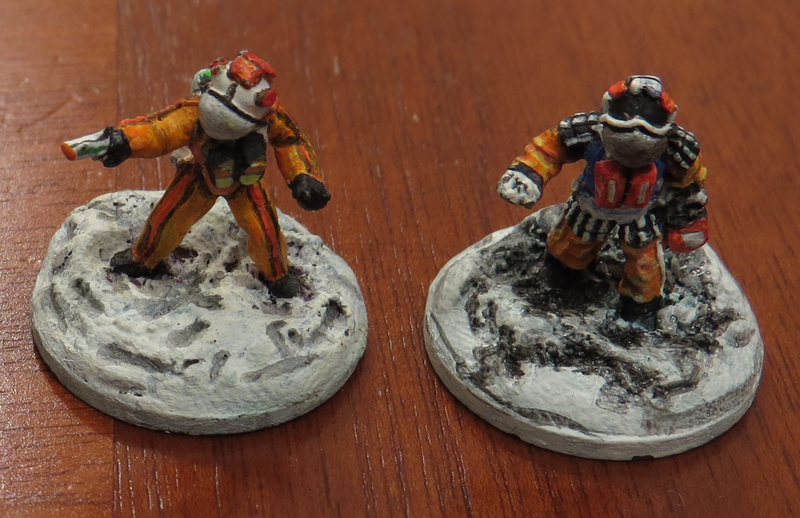 I hope you’ve enjoyed this feature on some of my Traveller miniatures! This entry was posted in Classic Traveller, Role Playing Games and tagged Citadel, Classic Traveller, games workshop, miniatures. Bookmark the permalink.